Many chronic diseases are preventable through better diets and increased physical activity. This is especially critical in the Bronx after an annual Robert Wood Johnson Foundation and University of Wisconsin study ranks the Bronx last out of 62 New York State counties for the seventh year in a row. Over the past year, the Bronx Community Health Network (BCHN) led Bronx REACH CHAMPS coalition has made great strides in implementing interventions aimed at reducing obesity and improve overall health and wellness of the Bronx’s culturally and ethnically diverse population. REACH CHAMPS coalition partner Montefiore Office of Community and Population Health is working with supermarket owners, food suppliers, and distributors on adopting the Shop Healthy NYC program to help increase access to healthy foods for our communities. 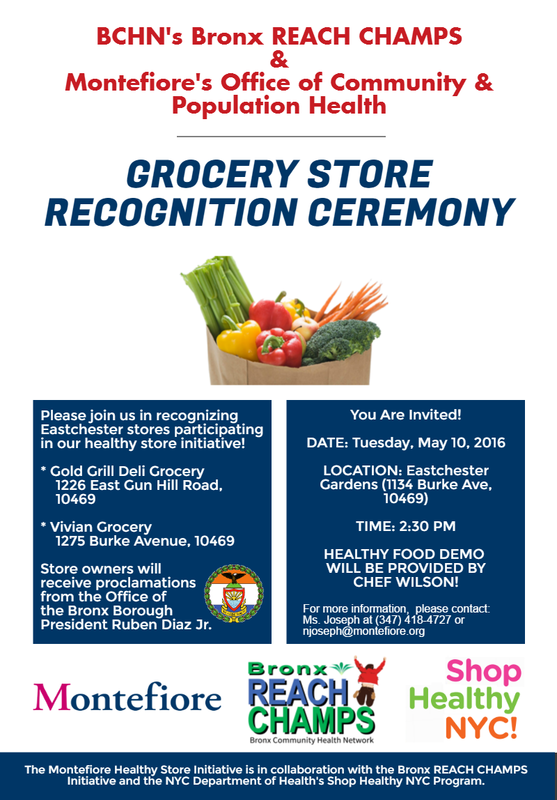 On May 10, a celebration will be held at Eastchester Gardens where the Bronx Borough President’s Office will present Vivian Grocery (1275 Burke Avenue) and Gold Grill Deli (1226 East Gun Hill Rd) with Shop Healthy NYC proclamations, an achievement earned after each store completed all seven of the program requirements. The event will include a healthy cooking demonstration by Chef Geneva Wilson.